Vossloh Cogifer is a world leader in turnout design. The company offers global solutions that include turnouts with all their equipment and safety products for drive, locking, control and signalling systems. We offer the best, most innovative solutions, using our international experience, while guaranteeing a high level of reliability and optimised service life costs. 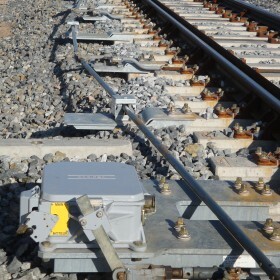 Our turnouts are manufactured, workshop assembled and shipped preassembled on special wagons: a solution that limits tracking mobilisation time while giving better value for money. From the design of turnouts to their delivery and associated services, Vossloh Cogifer provides a full range of services for turnkey turnouts. Vossloh Cogifer, thanks to its experience, is able to develop new solutions through technical innovations, permanently providing optimum safety while significantly increasing the service life of equipment. Vossloh Cogifer is the ideal partner for supplying safe, proven and more economical solutions for an ecological sustainable development approach.